The Ordnance Survey have uploaded here maps of the historic counties of the UK. 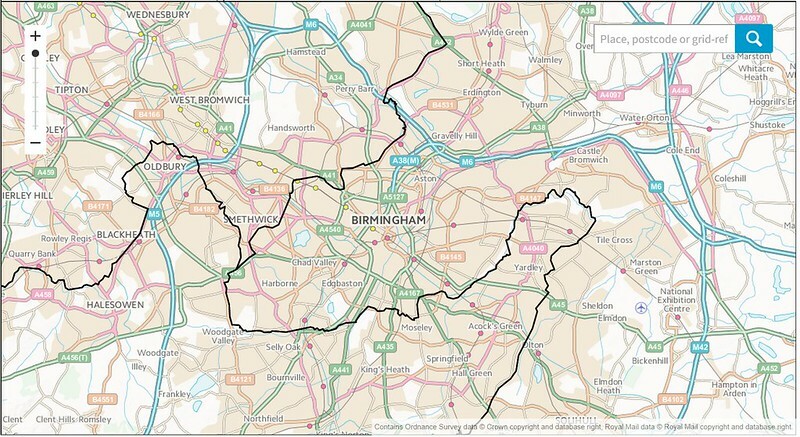 These varied over time, but I have extracted the boundaries for Birmingham so show where the old counties used to end. What I found interesting was that Stoney Lane through to Walford Road were the boundary between Worcestershire and Warwickshire making the junction of the Stratford Road and Warwick Road fully in Worcestershire. Thanks be to the OS. I am not sure of the date and I thought that Harborne was at one stage in Staffordshire. Having glanced at Wikipedia it appears that Harborne moved into Warwickshire in 1891. This demonstrates the relationship between historic counties and current ceremonial counties in the North of England.